I recently was hired by a new client needing help with several rooms in her new home. We decided to get started first on her master bedroom and I was so excited to see this space transformed. I presented her with a couple of different options and am curious to hear which one you prefer. or this one with the contrasting wooden night tables? My client picked the grey night tables so now we’ve made some tweaks. I decided to move the art to the side of the window (there will be a coordinating framed art on the other side of the window). As you can see in the photo, the ceiling height is a bit wonky where the bed is (only 89” from floor to molding) so since we are going with a larger headboard than what she currently has I think the art will make more of an impact on the side wall. They are each going to be 24 x 30 framed pieces! So now we are almost done with the room! I can’t wait to share photos when everything is here!! The bed and rug are backordered until the end of February so I will have to be patient and wait until March for the finished photos. 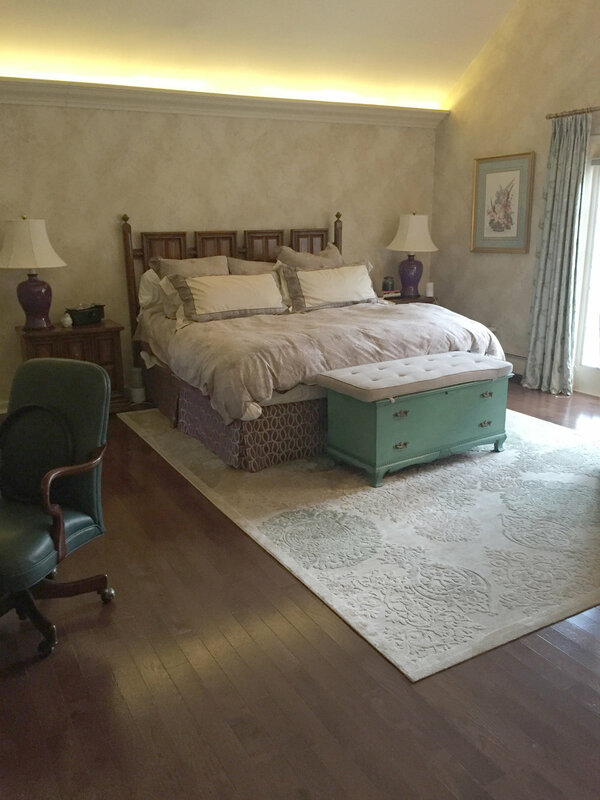 Do you have a room in your Northern New Jersey home that needs a transformation? I’d love to help you create your dream space, whether it’s a master bedroom, a nursery, a kitchen, dining room, or living room / family room. Christie Adams Design is a Bergen County interior designer based in Wyckoff NJ. She is available for interior design projects in northern NJ within 45 minutes for Wyckoff. Christie also works with house flippers, builders and developers who are working on homes in the Ridgewood, Wyckoff, Glen Rock and Franklin Lakes area.